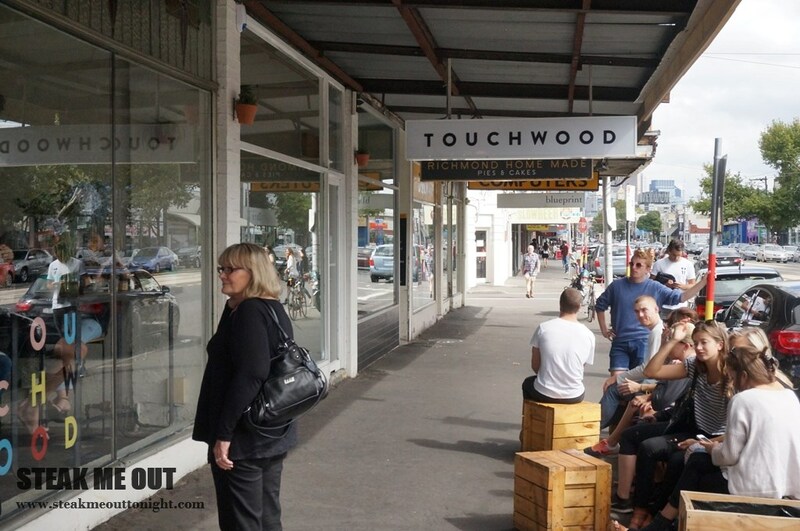 Touch wood has been on my radar for some time; I read in a blog that the PB& J waffles and that the Pulled Pork Tacos were to die for, so I checked the menu online and rocked up one Sunday to try my luck. Unfortunately I didn’t have any, and we ended up waiting around 20 minutes for a table – which I think in around Melbourne these days is pretty standard. After about 10 minutes and almost an entire coffee later, my friend and I settled on 3 breakfast items and 1 from the lunch menu. We ordered the Fruit bread, but swapped out normal butter for their maple butter, the avocado toast option 1 (beetroot relish, burnt lime, pickled red oinion, coriander and sumac salt among other things) with a side of bacon and a lamb chop (Yes, they have lamb chops on their breakfast menu, and yes, it is amazing), the banana and blueberry wholemeal waffle and a 50/50 pork veal sub with fontina cheese and tomato sugo. 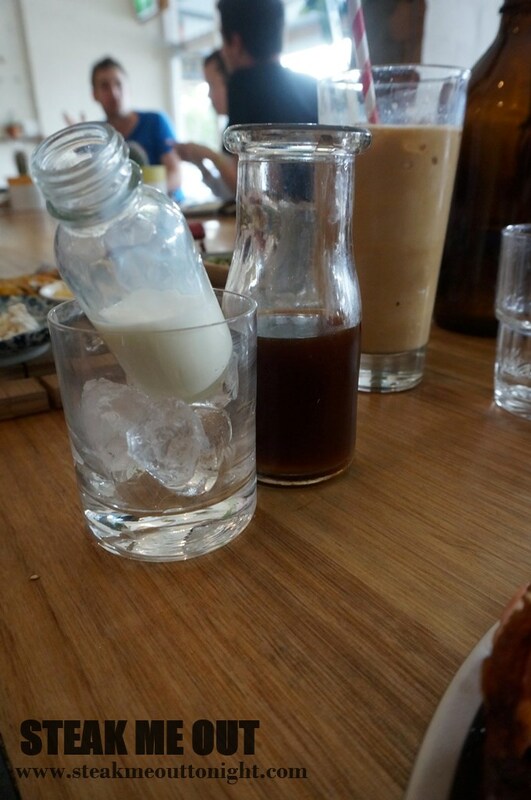 I also ordered a coconut cold drip to go with the food, mostly because it was something that a) I had never heard of, and b) didn’t think could work. 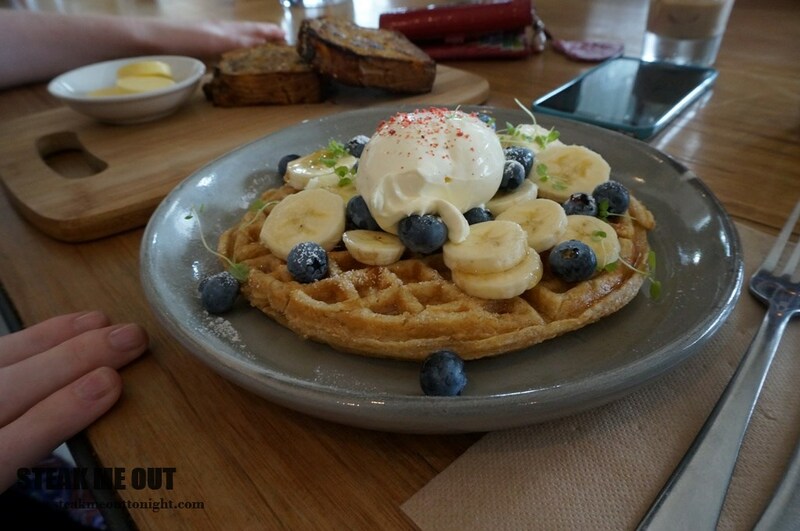 The wait between ordering and receiving our first meal was a long one, and first out was the Wholemeal waffle. It was dense, probably a little too much so, but nevertheless perfectly balanced in sweetness; the slightly tart berries and the sweet syrup and bananas all worked perfectly with the mascarpone on top. I enjoyed it, but would have preferred if they didn’t try to “healthen” it up with the wholemeal. Out next was the avocado with bacon and the lamb chop. I started with the chop because it looked fantastic, and it did not disappoint. 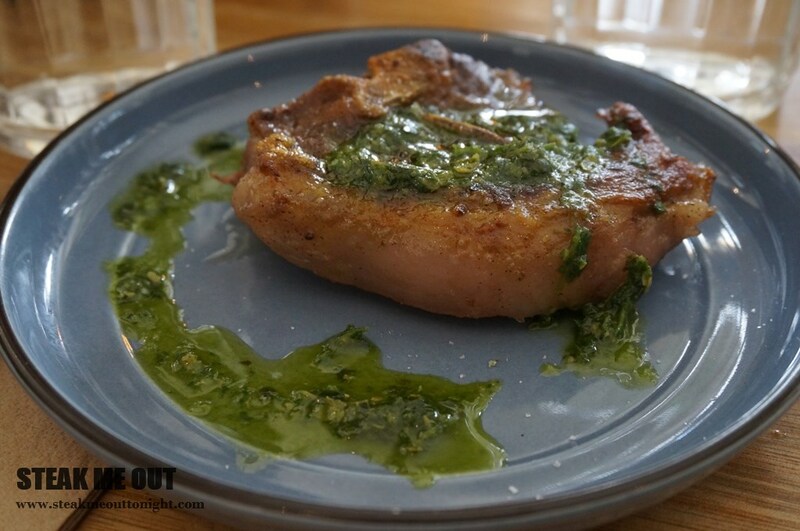 Served with salsa verde and grilled to perfection, it was practically flawless – there just was not enough. Onto the avocado; mashed nicely and layered with flavours of burnt lime sourness, beetroot and pickled onion with different types of sweetness, then a crunch of mixed seeds and finally topped off with a hit of salty bacon: divine. There was nothing left of this dish I can tell you that. 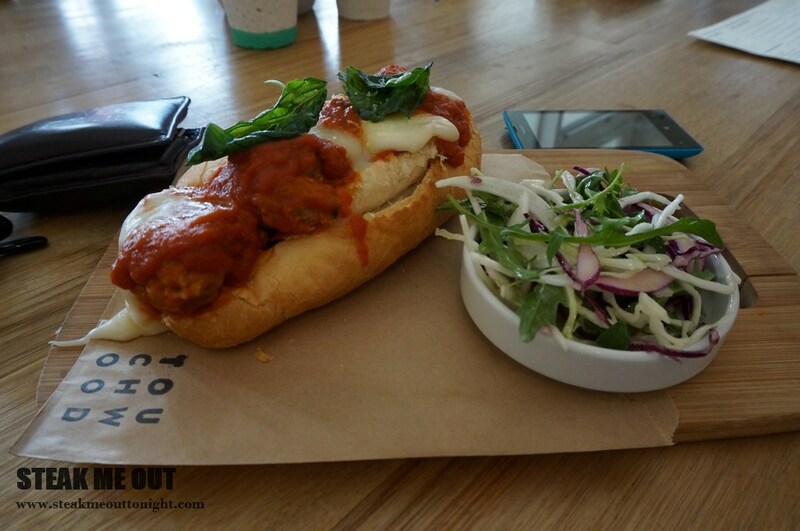 The sub came out next, and out of all the dishes it was the biggest let-down. Nice flavours but all of them were too subtle, and there was just too much bread. Definitely one of those dishes you could replicate at home for a fraction of the cost. Oddly the last dish out was the fruit bread, and was more bread fruit than fruit bread. SO much fruit, overly heavy on the apricot with not enough fig. 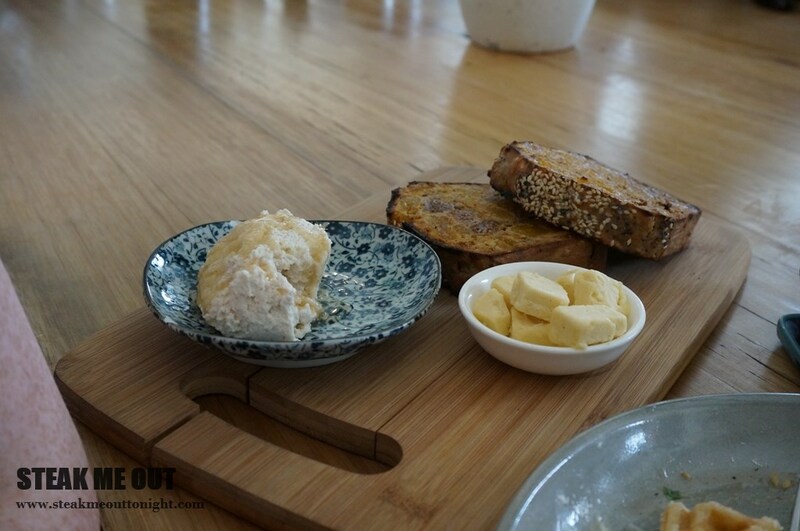 It came with a banana ricotta and the maple butter – the maple butter was phenomenal, and melted on the bread was heavenly. Once I started with it I didn’t even touch the ricotta. I left Touchwood thoroughly satisfied with the majority of the dishes I ordered, though was let down by service (they were busy, but still) and the weird coconut water coffee (odd flavour and just didn’t sit right in my opinion). I would go back to try the rest of their menu, or even simply just for another plate of those lamb chops. 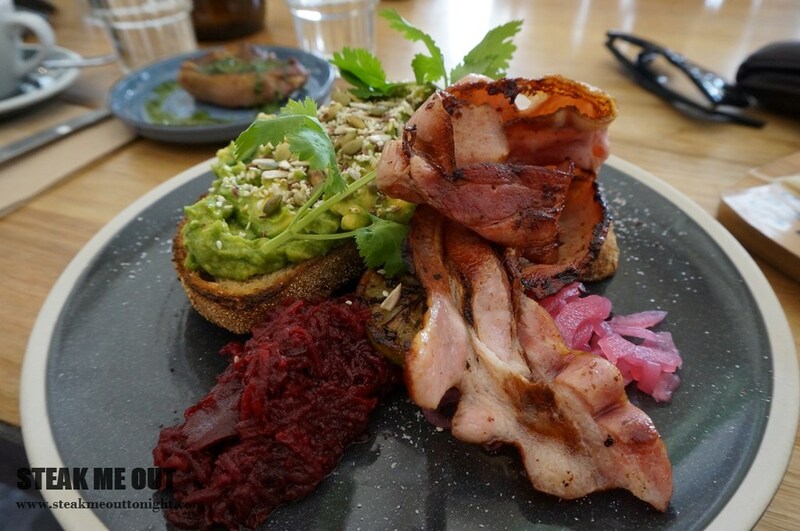 Posted on July 17, 2014 October 13, 2015 by AdrielPosted in Brunch n Lunch, MelbourneTagged Avocado toast, Bacon, Breakfast, Great, Lamb Chop, Maple Butter, Melbourne, Sub, Waffle.